* Could ECA’s Spell the End for Shore Power? The Environmental Control Areas along many shorelines may end up saving cruise lines and ports some money in capital expenditures at the same time as they are preventing a lot of pollutants going into the air. CND subscribers also read about a possible date being set to refloat Costa Concordia ... an alleged sexual assault by two men aboard Navigator of the Seas ... and everybody winning in Seattle, except the opposing team. * An Idea Whose Time Has ComeA few years ago when AIDA had a ship debut with a functioning micro-brewery aboard, we hailed it as an idea whose time had come. Now Crystal Cruises is innovating along the same line. Crystal has long been famous for their “Wine & Food” cruises, and now they are extending that appreciation of fine libations to those who appreciate a great lager or a full-bodied stout. Come November 5, Crystal Cruises will operate their first “Beer & Food” microbrew-themed luxury cruise. The US State Department just issued their annual report on crime and safety in the Bahamas, and they agree with us. Nassau and Freeport are dangerous places to visit. * There Will Be a Slight DelayThe Miami Herald reports that the opening of Miami’s new tunnel to the port, which was dedicated last week, will be delayed until mid-June while additional inspections and safety checks are performed. Costa Diadema, built on the Carnival Dream platform with an extra deck and the bow and stern rounded to make a more classical look, has a modified general arrangement to give new restaurant choices, an elevated Lido dining experience and an ample outdoor promenade that opens indoor spaces to al fresco cabana areas. 'This is certainly the best ship I've ever designed,' architect Joe Farcus told Seatrade Insider. Carnival UK’s Gerard Tempest believes cruise lines need to reassess their shore-excursion model as third-party suppliers continue to expand. Speaking at the Clia Selling Cruise Conference in Southampton, chief commercial officer Tempest said in light of the expansion of third-party suppliers he was putting a lot of thought into the best approach for selling shore excursions and tours. Almost everyone has a drawer in their kitchen that is the collecting place for all those things which have no other home - a couple of tools you want to keep handy, the odd kitchen utensils that don’t fit into the compartments in the silverware drawer, glue, batteries, odd screws and that key that for some reason stopped working are among the other important things that are just what you need, when the need arises. If you open the draw and just browse through, you’ll make unexpected and exciting finds. It’s always interesting. The same is true at Princess Cruises. Each year when they announce the next year’s itineraries, they come out area by area, and then there are a lot of programs that don’t fit into the categories with everything else. They are to such far-flung destinations, and some only have a few sailings a year, Princess created their own category for them - “Exotics.” Like the kitchen drawer, if you start looking through it you will find something fascinating, and maybe something that you just can’t live without. CND subscribers also read about Queen Elizabeth - the first one ... rumors aren't always true ... and celebrating Italy Italian style. Just after the outbreak of the Second World War, Queen Elizabeth, the pride of the British merchant fleet and the largest liner in the world, was still fitting out at the John Brown & Co. Shipyard on the Clyde with her Maiden Voyage set for April 1940. Suddenly everything changed. Work on Queen Elizabeth slowed as priority was given to naval contracts and the main concern for the shipyard being the 16 September 1939 scheduled launch of the battleship Duke of York. The Government was concerned about Queen Elizabeth and it was decided she had to be completed as quickly as possible, but then what to do with her? Options included hiding her in a remote Scottish Loch for the duration of the war, moving her to Southampton or removing her from the British Isles. The latter option was in initially rejected, as her engines and equipment had not been tested. In November 1939, First Lord of the Admiralty Winston Churchill ordered that Queen Elizabeth should be made ready to leave the yard. A special licence allowed the yard to obtain valuable steel and additional labour and work began in earnest on getting Queen Elizabeth as ready for sea as quickly as possible. On top of preparing machinery and continuing basic fitting out, Queen Elizabeth was repainted in grey, losing her Cunard livery. In what was an experiment at that time, an electrically-charged rubber-coated copper cable was fitted around the hull to ensure she was immune from mines. As 1940 dawned, most of the work getting Queen Elizabeth ready for sea was complete. In February, Cunard received a letter from Churchill ordering that the ship be removed from Britain as soon as possible and stay away for as long as the order was in force. Apart from construction considerations, there were only two tides in 1940 that would allow safe passage for the ship down the Clyde: one on 26 February and one in August. 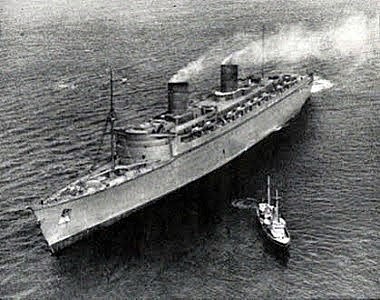 Queen Elizabeth had to be ready to leave in February, as the longer she remained static in the yard, the more likely an attack from the enemy. To confuse people, particularly enemy agents, a deliberate false rumour was circulated prior to her setting sail that she was going to Southampton, as that was the only British port with the dry-dock capable of accommodating her and she would need to be dry-docked in order to remove the launch gear still attached to the ship after her launch by Her Majesty The Queen in September 1938. The Government made the rumour extremely convincing as the dry-dock was prepared, 500 crew were signed on Queen Elizabeth for the short coastal voyage from Scotland, the Southampton Pilot went aboard in the Clyde to take her to her new home, and crates of furniture and supplies were sent to Southampton in preparation for her arrival. So convincing were these rumours that, on the day she was supposed to arrive in Southampton, German bombers were seen hovering over Southampton! On Monday 26 February, Queen Elizabeth began her journey from the yard and proceeded down the Clyde. The normal crowds were not present as no announcement had been made. The passage down river took five hours and was not without its problems. What should have been a glorious occasion – the Handover Ceremony – for Cunard in the 100th anniversary year of the start of its transatlantic service, was very subdued and brief as Cunard took ownership of Queen Elizabeth after she anchored at the mouth of the Clyde. Three days of tests and compass adjustments followed – all taken while Queen Elizabeth was at anchor as proper sea trials would be too risky. Then on 2 March 1940, a King’s Messenger arrived on board with a special sealed envelope. This contained the Captain’s orders and he was under strict instructions that they were not to be opened until Queen Elizabeth was at sea. The crew were assembled and given the option of leaving or staying for the journey. The few who chose to leave were kept in isolation until Queen Elizabeth was well on her way to her final destination. Later that day Queen Elizabeth, accompanied by four destroyers and several aircraft, headed to sea. Captain Townley opened up the sealed envelope. The orders were to head to New York! The largest and newest liner in the world soon left her entourage in her wake and she headed to sea and began her perilous dash to New York: untried, untested, unfinished, unescorted and, with her launching gear still attached, unarmed! Most of the 398 crew on board were unaware that their final destination was New York and expected to be back at home in Southampton after a few days. Instead of returning home after a few days, many did not return home for the duration of the war! All those on board formed a special club called “The Unruffled Elizabethans” (their aim being “...that true Twentieth Century Elizabethans are able to remain under all conditions completely unruffled”). They amused themselves at night with stories, songs and musical recitals. Radio silence had to be maintained and the totally blacked-out (at night) ship maintained a zig-zag course for the entire journey in order to confuse any U-Boats which may have spotted her. Her untried engines were able to make between 25 and 30 knots. It was not long before New York was itself aware of the approaching Queen Elizabeth. She was first spotted when a Trans World airplane flew over her on 7 March – the crew on the plane couldn’t recognize this speeding giant, as no one in America was expecting her. 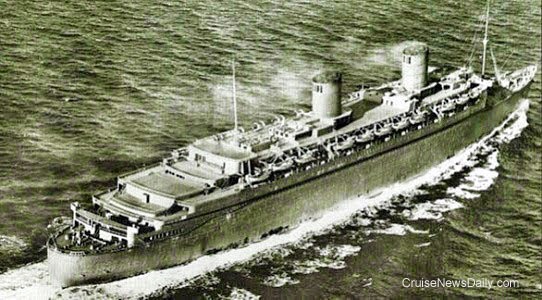 Even the New York offices of Cunard White Star were only made aware of her arrival after a Special Agent contacted them just prior to her arrival and advised them she was on her way. 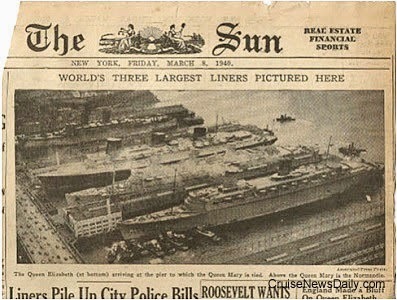 The world’s largest liner made her maiden arrival into New York on 7 March 1940, and as news circulated around the city of this extraordinary event, crowds gathered to see the new superliner. She berthed alongside her sister Queen Mary (also painted in wartime grey) and their great rival the French Normandie – the three greatest liners of all time together for the first and last time. 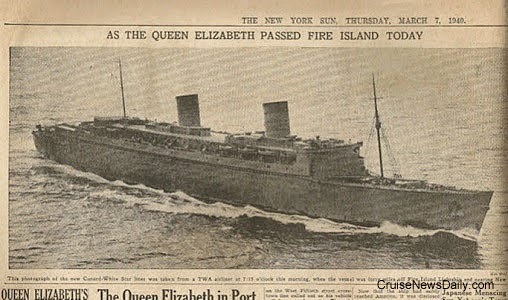 Queen Elizabeth was quickly dubbed the “Empress Incognito” by the press because of her drab wartime grey livery; but this Empress had survived the most gruelling and strangest sea trials and maiden voyage in history! Images courtesy of Cunard Line. All rights reserved. May not be copied or used without permission. Costa Luminosa will host the reception of the Italian international diplomatic service in Copenhagen. Costa Cruises will celebrate the birth of the Italian Republic in the company of its Guests onboard its ships, all flying Italian flag. The Italian Company will also support Italian embassies and consulates in some international celebrations aimed to promote Italian excellence to the local communities. Genoa – May 28, 2014 – Costa Cruises (www.costacruises.com), ambassador of Italy worldwide for 66 years, is celebrating the Italian Republic Day onboard its ships, all flying the Italian flag and therefore Italian territory. On May 31, during her call at Copenhagen, Costa Luminosa, will host the reception organized by the Italian embassy in Denmark for Italy’s national day. Costa Luminosa will be in Copenhagen for the 7-day itinerary in the Norwegian fjords which start right from the Danish capital, and will then visit Oslo, Stavanger, Bergen, Olden, Andalsnes. Besides the event on board Costa Luminosa, Costa Cruises will support Italian embassies and consulates in Washington DC, Abu Dhabi, Ankara and Istanbul in the celebrations organized to promote Italian excellence to the local communities. On June 2, Costa Cruises will celebrate the birth of the Italian Republic also together with its guests, onboard its ships deployed in the Mediterranean sea, Northern Europe and Asia. They will be invited to raise their glasses to the notes of the Italian national anthem that will resound on the decks of the Costa fleet. For 66 years Costa Cruises ships, the expression of Italian naval engineering talent, have showcased Italian-made excellence worldwide, standing out on account of the quality of service they offer, the variety of the entertainment, the stunning range of food & wine, and the exclusive collection of art on board. The strong ties between Costa Cruises to Italy will be furthermore strengthened on November 7 2014 by the christening in Genoa of the company’s new flagship, Costa Diadema. She is being built at Fincantieri shipyard in Marghera (Venice), with a total investment of around 550 million Euro. The project is employing a total of approximately 1000 shipyard workers plus another 2500 employees of allied industries. The benefits in terms of employment extend beyond the yard, especially regarding the fitting-out of the interiors of the cruise ship, with the involvement of about 400 contracted suppliers, most of which are Italian firms. 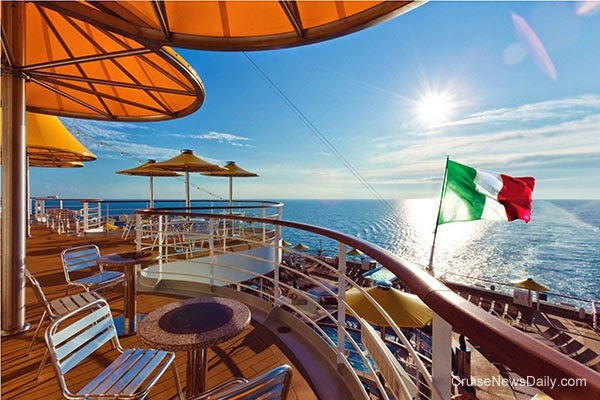 Costa Diadema will be the “Regina del Mediterraneo” (Queen of Mediterranean), with a special focus on Italy: in fact she will be deployed in the Mediterranean sea and she will be visiting five Italian ports during her inaugural month in November 2014: Trieste, Naples, Genoa, La Spezia and Savona. For 65 years, the ships of Costa Cruises (www.costacruise.com) have plied the seas of the world, offering the best in Italian style, hospitality and cuisine and providing dream holidays with the utmost in terms of fun and relaxation. Its fleet, the largest in Europe, has a total of 14 ships in service, flying the Italian flag, and 1 new ship to be delivered in October 2014. (Ft. Lauderdale, FL -- May 28, 2014) Ultra-luxury Silversea Cruises has announced key appointments within its sales team. Kim Guimaraes is promoted from director to vice president of national account sales for the Americas, reporting to Kristian Anderson, senior vice president and general manager for the Americas. She has been instrumental in advancing the strategic organization and growth of the national accounts portfolio, and will continue to expand and develop these key account partnerships with a focus on increasing revenue performance. Guimaraes joined Silversea in 2010 as a regional sales director, bringing to her position over 24 years of management experience in the travel industry, including travel agency sales development and 12 years leading regional sales efforts for Carnival Cruise Lines. Kris Endreson is promoted to vice president of field sales for the U.S. and Canada, reporting to Anderson. She will oversee management of the field and inside sales teams, with responsibility for developing and implementing strategic sales initiatives. Most recently she served as regional sales director for the eastern U.S. and Caribbean, and has a proven track record of outstanding sales performance. Endreson joined Silversea in 2011 as a regional sales director. Starting out in finance, her career transitioned to travel and includes 14 years as a sales manager with Royal Caribbean International. Phil Flad, who joined Silversea last year as director of brand partnerships, is named regional sales director for the eastern U.S., reporting to Endreson. He will be responsible for driving sales in the region by strengthening and expanding relationships with agency partners, and will also continue to manage brand partnerships. His past travel industry experience includes 16 years in management positions with American Express. "I'm delighted to announce these new roles for Kim, Kris, and Phil," said Anderson. "These talented individuals are a tremendous asset to Silversea, and will continue to work to enhance the strong relationships we have established with our valued travel agent partners." 28 May 2014 – Cunard Line is pleased to announce that legendary actress Kim Novak will join flagship Queen Mary 2 on her eastbound 6 July 2014 Transatlantic Crossing as a Cunard Insights speaker on board. Guests and fans aboard the seven-night voyage will be treated to two film screenings in the Royal Court Theatre, followed by a Q&A session with the renowned star. With a career spanning four decades, Novak is most well-known internationally for her starring dual role in Alfred Hitchcock’s psychological thriller “Vertigo” (1958) as Madaline and Judy Barton. Other notable films include “Picnic” (1955), “The Man With the Golden Arm” (1955), “The Eddy Duchin Story” (1956), “Pal Joey” (1957), “Bell, Book and Candle” (1958) and “Middle of the Night” (1959). She won the Golden Globe Award for Most Promising Newcomer – Female in 1955, and two years later won another Golden Globe for World Favorite Female Actress. In 2003, she was presented with the Eastman Kodak Archives Award for her major contribution to film. She also won a Golden Bear Award for Lifetime Achievement in Berlin in 1997. Novak’s programme for Cunard’s speaker series will feature an introduction and screening of her classic films “Vertigo” and “Bell, Book and Candle” in the Royal Court Theatre, with a special Q&A session lead by Hollywood expert Sue Cameron. Kim Novak is part of Cunard’s illustrious history hosting famed entertainers with peerless cachet. Legendary notables such as Elizabeth Taylor, Rita Hayworth, Cary Grant and Clark Gable frequently crossed the Atlantic on Cunard’s earlier Queens, Queen Mary and Queen Elizabeth. Since the debut of Queen Mary 2 10 years ago, the ship has welcomed film notables such as George Lucas, Uma Thurman, John Cleese and Angela Bassett. Joining the ship's 13 June Crossing will be film maker Wes Anderson and his frequent collaborators Academy Award® winner Tilda Swinton, Jason Schwartzman and Roman Coppola; actor George Takei of Star Trek and social media fame will join Queen Mary 2 on her 28 July Transatlantic Crossing; and Grammy® award-winning singer-songwriter James Taylor and his band will perform on the grand ocean liner on her 27 August Transatlantic Crossing. For nearly 175 years, Cunard Line’s Transatlantic Crossing has appealed to a broad range of sophisticated travelers with a love of glamor, elegance and tradition. Each Crossing aboard Queen Mary 2 features a series of Royal Nights themed balls on the largest dance floor at sea in the Queens Room; and the Royal Court Theatre presents West End-style musical revues and guest performers. Stateroom and Grills Suites are still available for the 6 July 2014 Transatlantic Crossing (M411A) with fares starting from $999 per person. More information about Queen Mary 2 and this voyage is available at www.cunard.com. Royal Caribbean said today they have hammered out an agreement with the Port Authority of New York and New Jersey to develop the next phase of Cape Liberty Cruise port at Bayonne (NJ) which will involve building a state-of-the-art cruise terminal needed to accommodate the next generation of the line’s ships, the Quantum-class. Never mind that they need the facility to be ready by the time Quantum of the Seas arrives there this November, so they already started construction months ago. It has happened again. European media is reporting another child was found drowning in a cruise ship pool this afternoon. 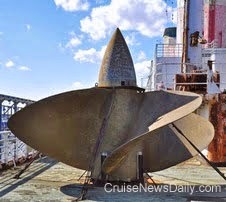 The SS United States Conservancy is running out of money. It costs them almost $55,000 a month to keep the classic liner SS United States in storage while they try to find a viable use for the ship. Over the years, they have raised literally millions of dollars from private sources (they receive no government funding), but that money is drying up, and to continue to keep the ship laid up, they are selling one of their most prized possessions - and they have to do it fast! SANTA CLARITA, Calif. (May 27, 2014) – Princess Cruises has debuted its 2015-2016 Exotics program which will take guests to a myriad of fascinating destinations that span the globe. The diverse deployment includes more than 40 unique itineraries to 140 destinations in 70 countries on six continents. Guests will be able to book cruises to Tahiti and the South Pacific, South America, Australia/New Zealand, Asia and Africa. In addition, cruisers will experience less-traveled ports- available on the line’s small ships, or circumvent the globe on a 111-day World Cruise sailing roundtrip from North America. Among the highlights of next season’s offerings are the lines’ largest ever deployment of cruises in Australia as Golden Princess becomes one of five ships to sail from the area - more ships than ever before for Princess; the line’s first Perth-based deployment during the Australian summer; longer cruises to Africa, Asia and the South Pacific; and sailings roundtrip from Singapore on Sapphire Princess. “Our award-winning itineraries offer our guests the chance to travel the globe and enrich their lives by being introduced to the worlds’ cultures and peoples,” said Jan Swartz, Princess Cruises president. "Our upcoming 2015-16 Exotics program underscores our position as a destination leader in the cruise industry." Sapphire Princess will offer a robust season of departures from Singapore to both ancient locales and bustling cities - sailing not only roundtrip from the port of Singapore but to Hong Kong or Beijing as well. In addition, Sapphire Princess will continue offering the line’s most popular Asia cruise- the 17-day Grand Asia itinerary, while small ship Ocean Princess will sail on a 36-day West Africa Adventure from London (Dover) to Cape Town, followed by a 35-day voyage ending in Rome, or a combined 71-day Grand Adventure cruise to a number of exciting destinations around Africa, home to a variety of vibrant cultures and fascinating wildlife. An unprecedented five ships will be deployed to four homeports in Australia this season, offering the widest variety of itineraries ever. Golden Princess will debut for the first time in Australia sailing during summer “Down Under” from Melbourne on five different itineraries visiting New Zealand, New Caledonia, Vanuatu and Tasmania. Sydney will be home to both Diamond Princess and Dawn Princess. Diamond Princess will offer voyages to an of assortment destinations, including a 33-day full circumnavigation of Australia, and two special sailings between Sydney and Auckland. Dawn Princess will offer two-week cruises throughout the season to New Zealand, Fiji, New Caledonia and the Loyalty Islands. Sun Princess will sail year-round, remaining in Sydney winter through June 2015 for a mix of cruises, and for the first time ever, will homeport in Perth (Fremantle) for the Australian summer offering both shorter and longer cruises – including a 46-day voyage to South Africa and the Indian Ocean. Sea Princess will return to Brisbane for the Australian summer season sailing seven-, 10- and 11-day voyages to New Zealand and islands in the South Pacific including Papua New Guinea. Star Princess sails to the Southern Hemisphere sailing between Santiago (Valparaiso) and either Rio de Janeiro or Buenos Aires on itineraries sailing the southernmost tip of South America and the Chilean Fjords. In addition, Star Princess will sail between two continents and cross the Equator on two departures of Andes and South American cruises featuring Peru, Ecuador, Costa Rica and and optional overland tour of Machu Picchu. The start of 2016 will see Ocean Princess sail on her first-ever full circumnavigation of South America, sailing roundtrip from Ft. Lauderdale. This 64-day Grand South America voyage will offer guests the opportunity to visit Antarctica on an optional overflight tour from Punta Arenas. Pacific Princess will return to Tahiti’s clear blue waters and offer 10-day voyages sailing from Papeete throughout the fall to explore this beautiful destination. Each departure includes two full days in Bora Bora. Adding variety to the 10-day program, Pacific Princess will include one departure of a 10-day Marquesas & Polynesia itinerary featuring the remote island of Nuku Hiva. Princess’ World Cruise will once again depart from and return to North America. The 111-day voyage on Pacific Princess will sail roundtrip from Los Angeles or Ft. Lauderdale visiting 35 destinations, 26 countries and includes overnight stays in Hong Kong, Dubai and Venice, as well as maiden calls to Chania, Crete and Bari, Italy. Additional information is available at princess.com. MIAMI, May 27, 2014 -- Jorge Vilches has been named president and chief executive officer of Pullmantur, one of Royal Caribbean Cruises Ltd.'s (NYSE, OSLO: RCL) six brands. Vilches will be responsible for the strategic direction and leadership of the brand to ensure its continuous growth and success. He will report directly to Richard D. Fain, chairman and CEO of Royal Caribbean Cruises Ltd.
Vilches has spent the past 10 years in the travel industry, holding various positions with the LATAM Group, a leader in the airline industry in South America. Most recently, he served as CEO of LATAM's long haul business unit, the group's biggest division in terms of capacity and revenue. Vilches' previous management positions at LATAM include CEO of LAN Peru, the main carrier in that South American country, and CEO at LAN Express, LAN's domestic operation in Chile. Vilches was born in Spain and has lived in a number of Latin American countries, most recently in Brazil. "Jorge has a proven track record of success in the travel industry, and extensive knowledge of the market. I look forward to his leadership at Pullmantur," said Richard D. Fain, chairman and chief executive officer of Royal Caribbean Cruises Ltd. "Pullmantur plays an important role in Royal Caribbean's long term strategy, particularly as we expand the brand's reach into Latin America. We are confident that Jorge will use his strategic insights and market awareness to make Pullmantur the undisputed cruise leader in Spain and Latin America." Said Vilches: "I am very excited to join the Pullmantur family. I'm a believer in strong, committed teams and sharp strategic focus. Together with an outstanding group of employees, I look forward to delivering fantastic vacations to Pullmantur guests around the world. I also look forward to joining the team at Royal Caribbean, one of the true leaders of the travel industry." Over the past 40 years, Pullmantur has built a position as the leader in the Spanish cruise market. Since 2006, it has belonged to the Royal Caribbean Cruises Ltd., based in the United States. Pullmantur's modern fleet of five ships has a daily capacity of more than 12,000 passengers. Since 2013, it has promoted a strategic growth plan in the Latin American cruise market, where more than 60% of its business is located. Royal Caribbean Cruises Ltd. (NYSE, OSE: RCL) is a global cruise vacation company that owns Royal Caribbean International, Celebrity Cruises, Pullmantur, Azamara Club Cruises and CDF Croisieres de France, as well as TUI Cruises through a 50 percent joint venture. Together, these six brands operate a combined total of 42 ships with an additional six under construction contracts. They operate diverse itineraries around the world that call on approximately 490 destinations on all seven continents. Additional information can be found on www.royalcaribbean.com, www.celebritycruises.com, www.pullmantur.es, www.azamaraclubcruises.com, www.cdfcroisieresdefrance.com or www.rclinvestor.com.